Rim locks are a common fixture in many old homes. You have probably come across a rim lock without actually knowing what it was. I don’t blame you for being unaware of rim locks, and I won’t blame you for dismissing them as any other lock. However, the rim lock is not just any other lock. In addition to their unique design, the rim lock has a rich and fascinating history, as many other locks do. If you think I’m misleading, check out the history of padlocks or the history of handcuffs, both make for a fascinating read. Rim locks are rather old locks, and their core design has not changed much over the years. This is one of the reasons you will usually find working rim locks on much older buildings. Enough of the chatter though, let’s dive headfirst into learning more about rim locks. Rim locks are surface mounted locks. As the name suggests, surface mounted rim locks are affixed to the surface of a door. Rim locks can be screwed to the surface of a door. I will discuss the installation of rim locks in more detail later. These locks are not suited for entry doors but you can easily find rim locks for interior doors. A majority of rim locks were originally made from cast iron. Replicas are often made from iron, brass, and nickel. The term rim lock can often be misleading because it doesn’t give you any information about the locking mechanism. Rim locks refer to the installation method, which is a surface mounted installation. A rim lock commonly makes use of a sliding latch or a deadlock as its locking mechanisms. The sliding latch is pressure operated and spring loaded. The latch is retracted when pressure is applied and extended when pressure is released. Most rim locks with sliding latches make use of handles and knobs. On the other hand, the deadlock bolt is used in conjunction with a key. The key is what is used to engage and disengage the lock or retract and throw the bolt. Another unique feature of the rim lock is that the key can operate the lock from both ends of the keyway, as is shown here. Rim latches and rim sash locks are the main types of rim locks. A latch is used to secure rim latches, while the combination of a deadlocking bolt and a latch are used on rim sash locks. If you assess a rim lock based on its appearance alone, you will come to the conclusion that rim locks are much different than any of the other locks you have come across. You will not be entirely wrong with this assessment. Most rim locks are warded locks. Warded locks make use of wards to prevent unauthorized access if the wrong key is used. The key that is meant to fit your rim lock will be shaped appropriately, in such a way that it will easily pass the wards in use. As you can tell, the locking mechanism varies greatly from the more common pin tumbler lock that works by separating pins at the shear line. Rim locks are surface mounted locks. They are fitted to the surface of the door. Most other locks have a lock body fitted into the door itself. Rim locks can easily be screwed to the surface of a door. The entire lock body of the rim lock is visible after installation. The term rim lock usually refers to the installation method and not to the locking mechanism itself. Rim locks make use of a spring-loaded sliding latch bolt or a deadlocking bolt. Some rim locks combine both locking mechanisms. These locks are referred to as rim sash locks. Most rim locks are warded. Warded locks use obstructions inside the lock or on the keyway to prevent unauthorized access. The earliest known model of the rim lock (that I could find in my research) can be traced back to 1830 in England. The pioneer behind the lock was the ironmonger James Carpenter. James Carpenter held the patent for the earliest model of the rim lock which he dubbed ‘Number 60’. Carpenter’s rim lock was birthed as a result of Carpenter seeking to improve upon the then designs of the latch bolt and the mortise lock. Funny enough, the rim lock and the mortise lock are related by much more than the virtue of being locks. James Carpenter initially started working on the new and improved designs alongside a man named John Young. The two gentlemen were meant to split the patent for the resulting lock. Instead of ending up with a joint patent, Carpenter patented a perpendicular action rim lock and Young went on to patent what would become the foundation for the modern mortise lock. Although James Carpenter laid the groundwork for the modern rim lock, it was his John Carpenter who really influenced the way the rim lock is used today. John Carpenter made modifications to his father’s patented design and was able to produce a rim lock that could be used bi-directionally. Rim locks have been in use for over 150 years, and they are still in use today. From their inception in England to their introduction into the early American colonies, the rim lock has been able to withstand the test of time. However, they are not as widely used as they once were. The advancement of locking mechanisms has led to the creation of new and improved locks that overshadow the rim lock in terms of security. It is highly unlikely that you will find a rim lock in use as one of the best front door locks. Although they are not as popular as they were in the 1800’s, the rim lock can still be found and in use. The rim lock is not as prevalent as it was in years past, but it is still used in some places. The trick is knowing where to look. In the past, most rim locks were used on exterior and interior doors. Today, they are commonly found on interior doors and on shed doors that are too thin to house traditional deadbolt locks or mortise locks. Primarily, rim locks are used as a locking mechanism on interior doors. Rim locks are best suited for interior use because of their security flaws. 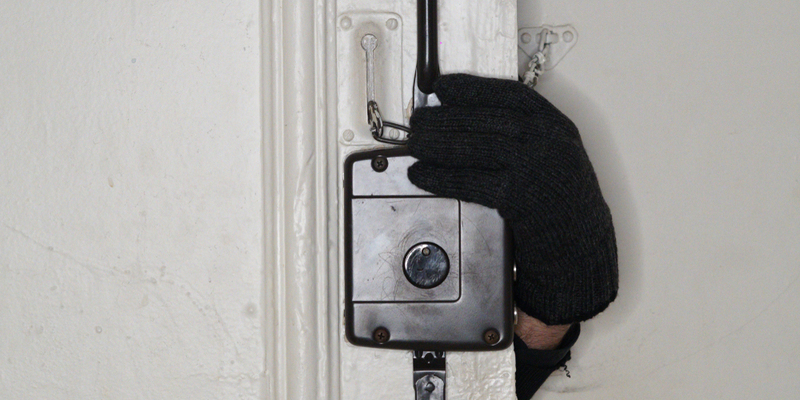 Deadbolts are integral to exterior doors because they are able to withstand much more force. Rim locks are not built to take as many hits as their lock counterparts, and they can easily be bypassed applying enough force. Interior doors are not exposed to the same threats as your exterior doors. As such, rim locks are the perfect addition for any homeowner who is looking for great interior locks. Their intricate designs and unique construction also make them a preferred choice among homeowners who are keen on the design. The rim lock is a unique and compact lock. Rim locks are ornate and are often installed as decorative pieces. In simple terms, rim locks look charming in a rustic way. Many homeowners like to take advantage of the vintage look of rim locks. Antique rim locks are often restored and installed to add charm to a home. In lieu of restoring an antique rim lock, homeowners can buy modern replicas of the rim lock. Rim locks are not the most secure locks around, which is why they are not often used as exterior door locks. If you do happen to see a rim lock in use on an exterior door, it is likely to be an additional lock. Some rim locks are used in addition to the more secure deadbolts and mortise locks. The presence of a deadbolt negates the inherent structural weaknesses of the rim lock. As an additional lock, the purpose of the rim lock is two-fold. First, it helps bolster the security of the primary lock that you have in place. Secondly, they add an air of charm to your home, as was discussed in the point above. Exterior door locks should ideally be much stronger than the interior locks. Simply because they will experience more revolution cycles and they are your first line of defense against burglars. The way a rim lock works is rather simple, especially in comparison to other locks that exist on the market. It would take much less time for someone to explain a rim lock than it would for them to tell you the true definition of a smart lock. The main parts of a rim lock are the lock body and the keeper. In addition to these, the escutcheon plates and privacy latch will also be explained. 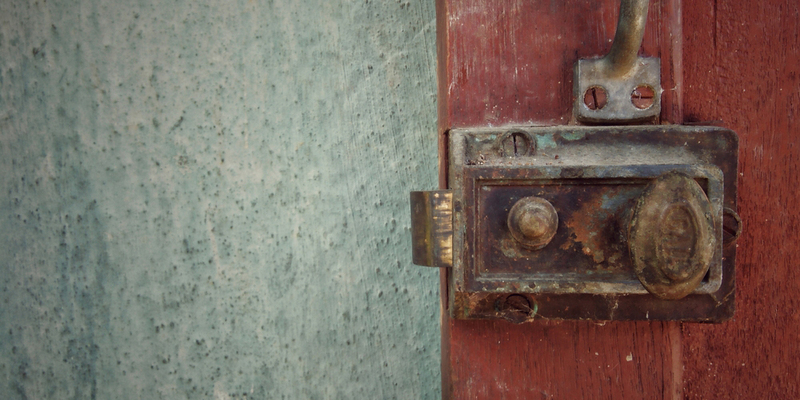 The rim lock body was usually made from cast iron, but in recent years brass and nickel have been used as substitutes. Inside the lock body itself, rest the spring loaded latch and the deadlock bolt. If the rim lock in question is a rim latch, then the lock body will not have a deadlocking bolt. The keyway of a rim lock is designed bi-directionally. This was the cool addition that John Carpenter made to his father’s early design. A bi-directional rim lock can be installed on right-sided or left-sided doors. Rim locks are traditionally keyed locking mechanisms. However, the rim latch is not always used alongside a key. The spring-loaded latch is operated by means of a handle or a knob. The knob spindle is run through the door to connect the outer knob to the lock body. The key that is used with the rim lock operates the deadlocked bolt. The deadlocked bolt is held in place by a lever mechanism. When raised, the lever mechanism latches onto a section of the deadlock bolt and holds it in place. The bolt can only be retracted once the lever is lowered, and this is where the key comes into play. Once the appropriate key is inserted, the lever is engaged in a way that lifts its top section and lowers its bottom section to allow the bolt to retract. Essentially, the key is engaging the lever while simultaneously lifting, and sliding the deadlocked bolt back and forth. The keeper is the companion piece to the rim lock body, and it is meant to hold the latch and the deadlock bolt in place when a specific door lock is closed. Similar to the lock body, they are usually made of cast iron. Modern rim locks are made of composite materials that weather better over time. The keeper is the rim locks equivalent of a door strike and strike plate. The keeper is directly fastened to the door jamb. Escutcheon plates are usually flat metal pieces that are fitted to provide additional protection, and also to add some decorative flair. There are some modern locks that use escutcheon plates and some that don’t. However, due to the vintage design of the rim lock, escutcheon plates are an important part of the overall lock. They are used to guard the doorknob and to outline the keyway. Not all rim locks have privacy latches, but it is still an important part of the rim lock that you should be made aware of. The privacy latch allows the door using a rim lock, to be locked from the interior. The unique thing about the rim lock is that once it is engaged, the door cannot be operated by using the key on the opposite end unless the privacy latch is disengaged. This proves to be a hazard in emergency situations because the door usually needs to be kicked down for access to be granted. The keeper should be the first part of the rim lock that you install. The rim lock keeper should be affixed directly into the door jamb. Position the keeper at an appropriate height. After this has been done, use a screwdriver to screw in the keeper so that is attached directly to the door jamb. Since rim locks are bi-directional, verify that the latch is in the appropriate direction before you begin mounting the rim lock body. Reattach it to the node. Close the rim lock body. Drill the holes for the spindle and the keyway. After the holes have been drilled, you can begin screwing in the lock body to the door. With the lock body appropriately screwed in, attach the doorknob and its spindle. On the exterior section of the door, use a screwdriver to screw in the escutcheon plates for the door knob and the keyway. Connect the exterior section of the doorknob to the spindle, and insert the set screw if applicable. Test your rim lock to make sure it is working appropriately. A rim lock does not deter access because the entire lock body is left exposed. This means that if a burglar were to target your rim lock, they would be able to bypass it if they had a screwdriver handy. This is one of the reasons why rim locks that are used on exterior doors and entryways are not approved by most insurance companies. Rim locks easily succumb to brute force attacks. They can be kicked and rammed, and the latch can easily be overcome by simple maneuvering tricks. Warded locks can be exploited by using a skeleton key, and these keys are very easy to come by. Simply type in skeleton key into Amazon and see the results that pop up. The weaknesses of a rim lock can be counteracted if the lock is used in conjunction with a more secure primary lock. A good choice for a primary lock in this scenario is an ANSI Grade 1 rated deadbolt. Rim locks are a part of lock history and they will likely remain in use for quite some time. Always remember that a rim lock is better suited for use on interior doors rather than exterior doors. Using a rim lock on the entry doors in your home can potentially cripple your home security and this is a risk you do not want to take. 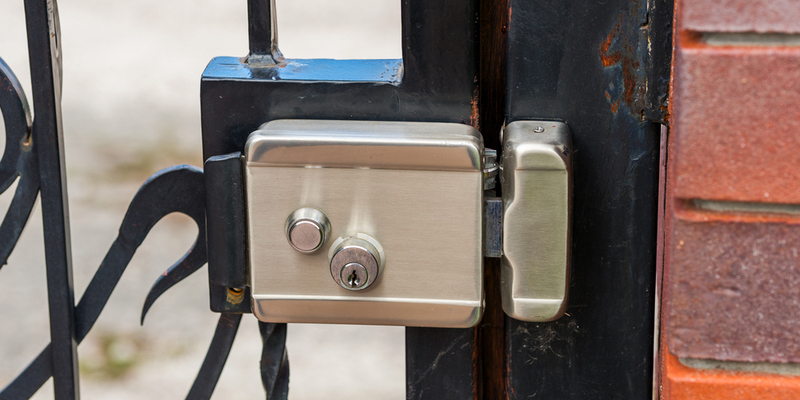 If you ever need help installing a rim lock, do not hesitate to contact a trusted locksmith.